Located 700 meters above sea level, the Garita de Herbeira viewpoint is among the highest cliffs in Europe. A look from its heights towards the sea startles even those who do not suffer from vertigo: the almost vertical fall from half a mile high and the open view of the ocean are enough to take anyone’s breath away. A Garita de Herbeira is the highest of the cliffs formed by the Serra da Capelada where it meets the sea. 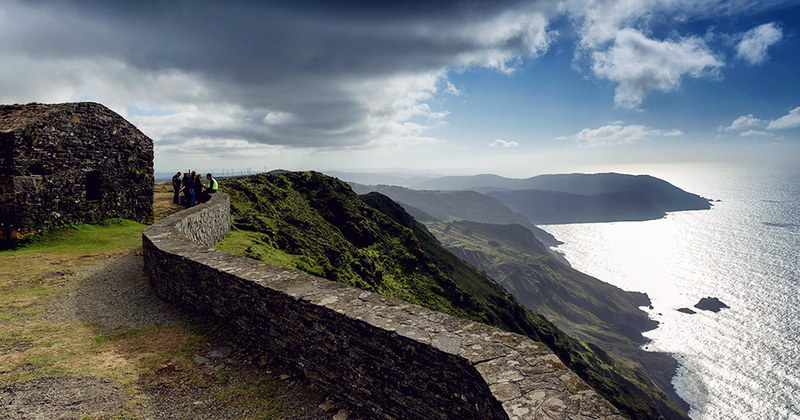 This area, frequently hit by strong winds, can be reached by climbing from Cariño (and perhaps making a stop halfway along the ascent at the beautiful A Miranda viewpoint, with wide panoramic views over the estuary of Ortigueira); or from the centre of the town of Cedeira. This last option is the one chosen by hikers who take some of the most popular hiking routes in the area, such as Ruta dos Peiraos or Camiño de Santo André. Because it is here, halfway between Cedeira and Herbeira, where the mythical village of Santo André de Teixido is located. Everyone who is aware of and believes in its tradition knows that it is impossible to avoid visiting this small town nestled between ravines and hanging over the sea: those who haven’t been there while alive, will go once dead, reincarnated as a small animal. In all seriousness now: Santo André de Teixido is one of the most popular spiritual pilgrimage centres in Galicia and also a good place to go, even if you do not have these kinds of concerns. The modest church, the handful of houses that surround it, the descent to the fountain and a wild and idyllic landscape make this area one of the essentials of the Galician north. The road that connects Cedeira to the Garita de Herbeira is narrow and turns right and left along the cliff, passing by several viewpoints from which you can see, to the left, the imposing masses of Cape Prior and the rugged coast to Valdoviño; and to the right the cliffs and the white houses of Santo André. Along the way one must be careful: cows and horses, free in this part of the Capelada, walk with total freedom in a territory that has been their home for hundreds of years. One more fact, quite peculiar, about this magical area of ​​Galicia. In the cliffs of Herbeira an amazing phenomenon occurs, known by the locals as “o pe do vento” (the foot of the wind). It is a very thick cloud that appears over the Serra da Capelada on days when the north east wind blows strongly, and sometimes coincide with the sunny days of summer. Thus, it may happen that while Cedeira enjoys a spectacular sunny day, higher up the cloud moves up the cliff covering the sky and lowering temperatures considerably. In these cases, enjoying the scenery is difficult and driving on the road to Santo André can be quite scary, but the air of mystery is certainly hard to match.